The C.A.C.I system is one of the most sought after salon treatments available, allowing you to enjoy the benefits of a non surgical facelift without going anywhere near a knife! 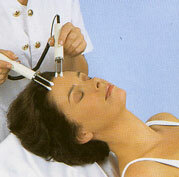 Using specific facial techniques on conjunction with a combination of slimming and toning applications, C.A.C.I works to restore and redefine facial muscles, reducing lines and wrinkles while simultaneously tightening and toning sagging muscles. C.A.C.I not only achieves fantastic results but also saves you time and money.